There is nothing more exciting to a child then cooking in the kitchen like a big kid! I remember when I was young how thrilling it was when mom would hand us an apron and let us get up on the counter to help her cook. There is a joy that can't be found anywhere else then in the kitchen. 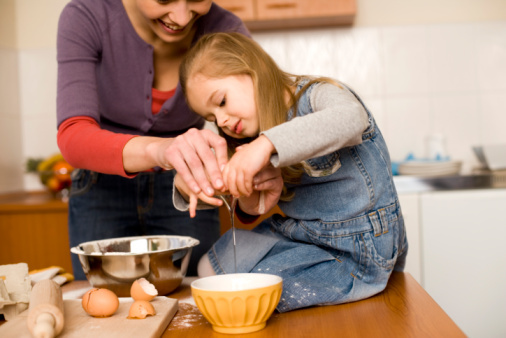 Teaching a child to enjoy cooking at an early age is so important. 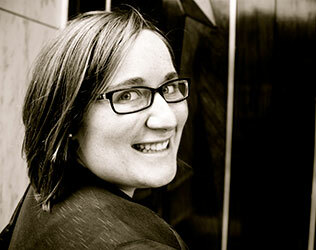 It instills in them important principles that cooking teaches. ~ You learn to follow instructions. ~ Appreciation is gained for good food. One of my most treasured memories cooking as a child was making Chocolate Chip Cookies on the counter with my mom and brother. This classic cookie is not only one of my all time favorite things to eat but brings back those sweet memories of being in the kitchen when I was little. My brother and I always helped measure out the ingredients into a huge silver bowl with my mom. Each ingredient became a piece of a huge city. Flour and sugar making the ground with packed brown sugar buildings and butter chunk homes. But the best part was adding the "people" as we sprinkled the chocolate chips over our little city we would get so excited for the final fun step. My brother and I's little hands would dive into the city and attack. We were the giants that got to mix the city together into a great smooshy dough! 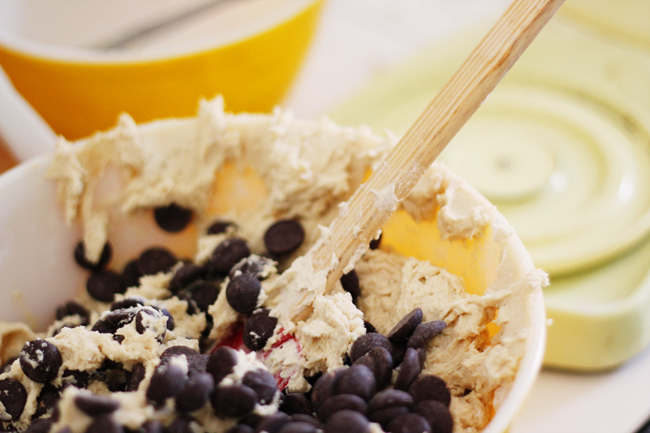 Excitement would fill our little minds each time it was announced that cookie dough needed to be made. That counter was our play land to pretend and create. Treasure the times to teach your child, grandchild, or friend's child to cook. These will be moments that stick with them for the rest of their lives. You as a family will benefit as well as you are gathered together cooking and eating in the kitchen more. ~ Have more quality time as a family. ~ Save money by eating in, instead of out. ~ Enjoy trying new flavors and recipes together. ~ Healthier foods and recipes you know all the ingredients put into it. 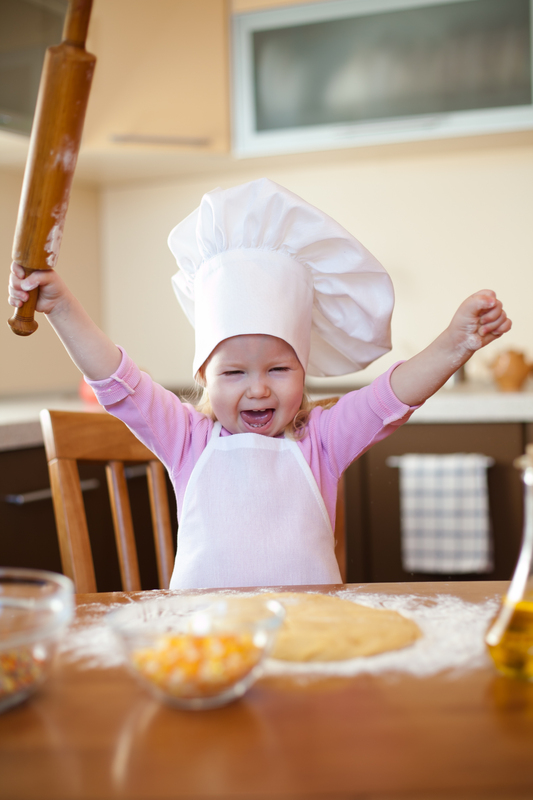 Whether you are mixing cookie dough, rolling out a pizza, making a salad or putting together a casserole letting a child in will make it all the more fun. Sometimes it is a little more work to have a child help in the kitchen but the benefits of having them there are countless. There are tons of family fun recipes to explore on Pintrest and in your recipe files. So, let your kiddo plop on the counter and make a mess with you being a cookie monster and smashing that city of ingredients together! Are you in need of a good Cookie Monster recipe? This is a really fun recipe to try with kids and enjoy together as a fun family treat or while you are enjoying some March Madness. It's been the rage on Pintrest and can soon be the rage in your home. 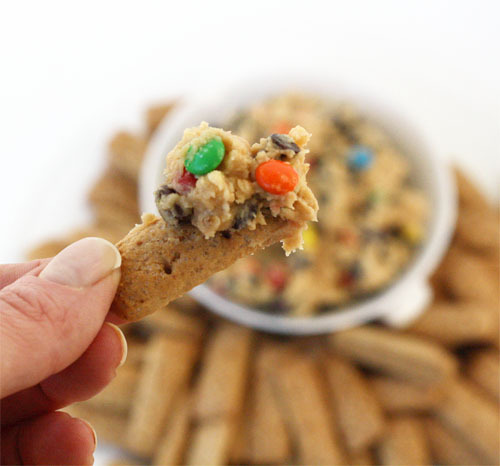 Dip in some graham crackers, apples or just eat it J up like a real live cookie monster! There are so many wonderful things to make in the kitchen…add this one to your list!